Given the rising economic, health-related, and environmental costs of burning fossil fuels, combined with the accelerating impacts of climate change, a transition to 100% renewable energy is imperative to safeguard our shared future. Currently, more than 2/3 of global Greenhouse Gas emissions originate from the burning of fossil resources such as oil, gas and coal. A recent report found that a third of oil reserves, half of gas reserves and over 80% of current coal reserves must not be used before 2050, if global warming is to stay below 2C. Urgent action is required to transition to 100% renewable energy and reduce the risk of arriving at irreversible tipping-points. The good news is that such a transition to 100% renewable energy is no longer an utopian ideal with the rise of supporting financial and policy incentives which makes the choice to switch to renewable energy sources increasingly realistic. Several jurisdictions across the globe have already reached 100% renewable energy (RE) targets and many more are beginning the journey towards a fully fossil and nuclear-free society. An ambitious 100% renewable energy target is not only about transforming our energy supply but also a more holistic vision of a better future. A transition towards a fully renewable energy powered society offers several other benefits such as reduction in air, water and land pollution, health benefits, improved energy security and resilience, sustainable economic growth, employment, social and human development and, given its inherently decentralised nature, opportunities for improved democratic decision-making processes and citizen involvement at the local level. We believe that learning from best policies and practices from around the world will be fundamental in equipping political decision-makers with a toolkit of instruments, strategies, and concrete actions to successfully implement a 100% RE target. 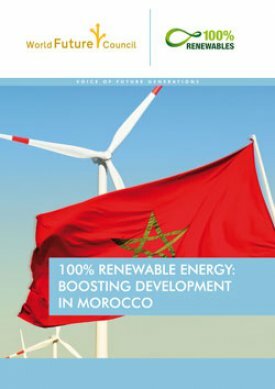 The World Future Council has prepared some brief case studies on how to achieve 100% renewable energy targets, including Frankfurt, Denmark and Cape Verde – find out more here. 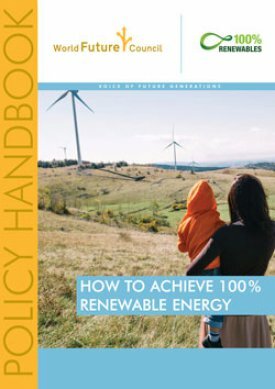 Based on several case studies and lessons learnt from around the world, 5 key policy guidelines for a successful transition to 100% renewable energy have been identified and recommended to policy-makers, who wish to streamline their efforts in achieving this target. Making energy efficiency a top priority is a critical part of achieving a 100% renewable energy future. By developing more efficient energy infrastructure, it becomes easier to develop, finance, and integrate the remaining infrastructure required to meet a jurisdiction’s energy needs with locally available renewable resources. This can significantly reduce the total investment requirements for reaching the target and support decoupling economic growth from the growth in greenhouse gas emissions. 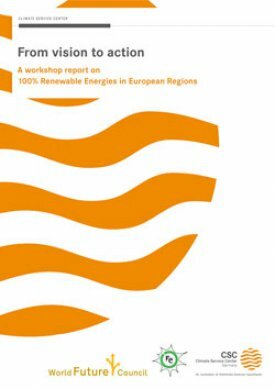 Achieving 100% RE will require furthering the interconnection between the electricity, heating/cooling, as well as transport sectors, allowing renewable electricity to be channeled to a wider range of dispatchable end-uses such as within thermal systems or electric vehicles. Case studies suggest that shifting the reliance of the heating and transport sector to a greater reliance on electricity should be a policy priority in the decades ahead. At the heart of a successful 100% RE strategy, it is fundamental to allow open participation in the development and financing of energy infrastructure. Governments must implement inclusive policy frameworks that allow new business models to emerge and foster sustained citizen engagement. By providing market access to a wide range of stakeholders, policy-makers can help build positive synergies across the region and build further momentum. Implementing a 100% RE strategy requires the participation of a variety of stakeholders, making both the breadth and the depth of awareness crucial to long-term success. Educating and informing the public as well as businesses facilitates building public support and acceptance. 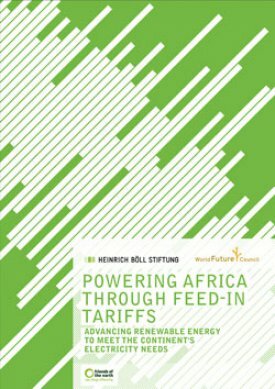 As local opposition to energy infrastructure can be a major barrier to achieving 100% RE, educating citizens, fostering engagement, and improving public outreach must be a top priority for policy-makers. A successful 100% RE strategy requires an integrated approach across policy areas such as fiscal, energy, economic, as well as infrastructure policy. Additionally, this includes an approach that reaches across different governance levels. It entails collaboration across government departments and between all levels of society. Policy-makers must, therefore, increase the coherence of their policy and planning and deepen the policy dialogue between previously distinct sectors and government departments in order to sustain the political and economic momentum required to achieve 100%. Implementing sustainable solutions in the transition to 100% renewable energy contributes to the progression of our interconnected global movements. The World Future Council invites you to join us as a voice for future generations. The ‘Global Pact’ aims to build an effective ‘Coalition of the Working’ based on our common values in an effort to move from competition to collaboration, individualism to holism, all in the aim of securing our shared future through mutual successes. Please contact us if you are interested in working together to further the urgent priorities of the Global Policy Action Plan. Global 100%RE is the first global initiative that advocates 100% renewable energy. It connects the fragmented dots of renewable energy advocates to build a global alliance, proving that being powered by 100% sustainable renewable energy is urgent and achievable. This unique campaign builds on initiatives that already take place on national, regional and local level and steers the global discourse on renewable energy towards 100% RE as the new normal. As well as the 100%RE campaign website, you can find out more on our blog 'Power to the People'. Founded in Ethiopia in October 2009 by the World Future Council, this member-driven network comprises of around 1.400 members from 90 countries. AREA members share information, knowledge and experience via an online platform and monthly phone discussions, meet for international AREA conferences and workshops and present their positions at relevant conventions and forums. AREA is a registered Voluntary Association with its secretariat in Johannesburg, South Africa. Ahead of the Climate Summit in New York on September 23, WFC Councillor Frances Moore Lappé asks why we are together creating a world that we as individuals would never choose.